A couple of years before Duck Dynasty I came across an ESPN.com article about a family in Louisiana that loved to duck hunt and was making a killing at making duck calls. I was impressed with what I read. Then I came across a few videos online of Phil and Jase speaking in churches. Then I was really impressed. Finally, the hit TV show came on and I fell in love with this down-to-earth, salt-of-the-earth family of rednecks. 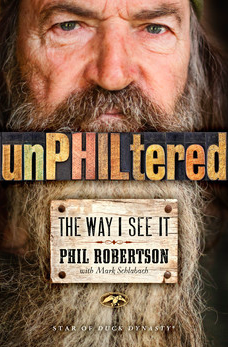 unPHILtered is exactly what the title says: Phil telling it as it is, no filter, and I don’t know if I can argue against the man on anything he says in the book. “He’s a backward anti-intellect.” – He may be backward, but he’s sharp as a tack and has an earned master’s degree. He’s not anti-intellect. “He’s a homophobe.” – He’s not. Unless your definition of a homophobe is someone who does not enthusiastically endorse the homosexual lifestyle. “He’s a racist.” – He’s clearly not. What he is… a man who was radically transformed by the Gospel of Jesus Christ; a man who loves his God, his family, his neighbors, and all people. He’s also a man of the outdoors. He has no use for a cell phone. He’d rather be in the woods or on the water than using technology. He’s wise. It’s clear he has excelled not only in business and in social relationships, but he has excelled as a husband and father. And he’s done it through hard work and good people skills. This country, and this world, would be a lot better off if they applied the PHILosophy of life of the Duck Commander. NOTE: I highly recommend you read his autobiography, Happy Happy Happy: My Life and Legacy as the Duck Commander first, then read unPHILtered.